You are at:Home»Featured»Got To Have Heart – His and Yours! When God created us, He inserted a heart within our chest, the mechanism that He made to pump blood and oxygen throughout our bodies. We all have one. Most of us rarely take notice of its rhythmic beats. It’s there but we pay little or no conscious attention to it – much like many of us have done to God – we know He’s “there” but ignore Him. We take Him for granted. Of course in the case of our physical heart that situation changes if something happens to it. In that instance, you bet we become much more attentive to and aware of it. We can’t live without it. So where am I going with this? Let me explain. The daily readings one summer day in 2008 included a passage from Ezekiel (3:23-28), in which God promised to transform the prophet and to give him a new heart and a new spirit so that Ezekiel would be able to lead others to Him. Through this Scripture passage, the Lord let me recognize how frequently my words and actions may have caused others to walk away from the God I professed to love. I asked Him right then and there for the grace to surrender my entire being to Him and to allow Him to use me as He willed. The very next day, I had a heart attack. He spared my life, opened three blocked arteries and gave me the new heart and spirit He promised Ezekiel and for which I had prayed the previous day. From time to time since then, I have asked myself: “What have I done with this new heart? Has anyone seen a difference in the way I have lived my life?” I am not always pleased with the answers these questions evoke. Each of us also has a spiritual heart – one which God provides and sustains as well and which He intends we use to love Him and others on His behalf. This heart too is one often ignored and inadequately exercised. We cannot live eternally without it. Had I adequately expressed my gratitude to this loving God who had chosen to spare my earthly life? I knew that He wanted more than mere words. He wanted me to love Him and all whom He has created as I had never before loved Him or them. But how was I to do this? “Teach me to love,” I prayed. His response: repeated promptings to consecrate myself and my family to His Sacred Heart and to the Immaculate Heart of His Blessed Mother Mary. And, like I have done so many times in my life, I kept putting Him off. I knew He Who is Love deserved this. I knew my family and I would benefit from it. So why procrastinate? I had no valid answer. But our God is persistent and patient! After much too long a delay, I did what God had requested me to do – my wife and I consecrated ourselves, our home and family to His Sacred Heart and to the Immaculate Heart of His Mother. This consecration is still a work in progress. But we have begun. We try to make our daily offering together and to renew our pledge of love and loyalty to Him everyday. The Lord of Lords and Kings of Kings and His Mother are now prominently enthroned in a place of honor in our home, immediately visible to all who enter – a constant and permanent reminder of the promises we made to Him and to Her. Finally, I had obeyed. I was headed in the right direction. But He was not done with me. The very day of this act of consecration, I went to spend some time before the Blessed Sacrament. As I was leaving my house, I was prompted to pick up a book I had not read in some time – Holy Hours by Concepcion Cabrera de Armida. I was dumbstruck. A tear or two fell down my cheeks. How could I say No? But how would I ever be able to do what He was asking of me? I had been unable or unwilling to do far less. How? I am afraid. I am scared…but I am going to rely on Him and try. How about you? Do you hear His promptings as well? 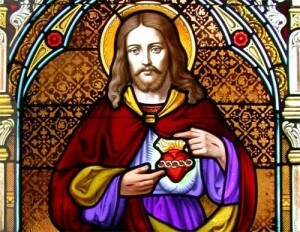 Isn’t this the perfect time to check your heart and enter His?